The only metric I keep track of at all it’s how long I’ve been out on the bike. Mostly, that’s because I have obligations as a dad to my family, and I need to make sure that I’m where I’m supposed to be at any given time. Because I don’t chase numbers, it leaves me free to slow down sometimes. I’m not chasing an average speed; I’m not chasing mileage. I’m not chasing anything. Because I can slow down, I found that I often stumble across things that I’ve ridden past dozens of times and never seen before. A new trail, a new road, a new path to venture down. If I was more numbers obsessed, I’d go screaming pass these trying to push my average speed up or cover more miles. But the benefits of slowing down can’t be overestimated. So, here’s to slowing down- to finding a bench to sit on, a path to get lost on, and a view to admire. 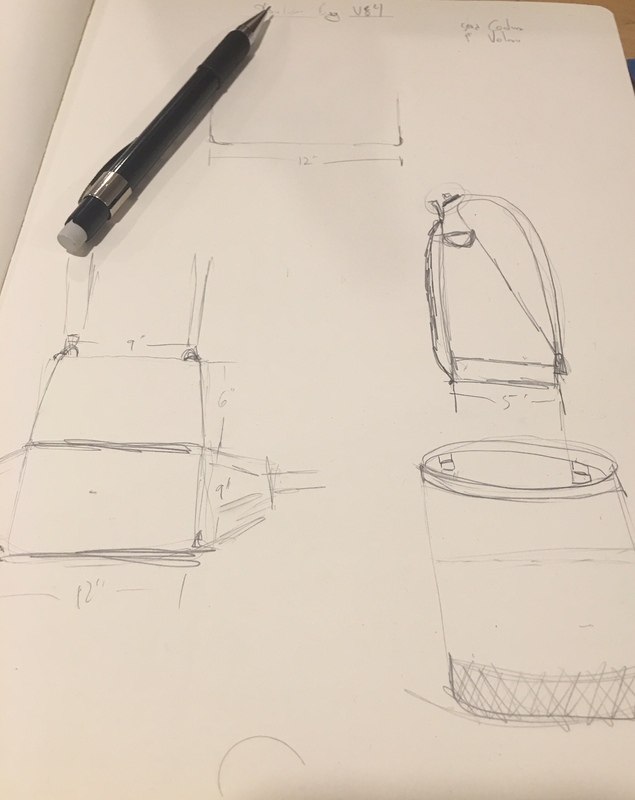 If you’re the one person who follows my SitReps here, you might be aware that I’v been working on designs for a new shoulder bag for some time. I’ve been edging steadily closer for the last few months, but it’s never come fully to the front of my list of projects. I’d like to have it ready for the Autumn, but that means starting to work on it now. It’ll take time to get materials in, make patterns, cut & sew, and finish. If I don’t start soon, I won’t be ready for the cool weather. And you know what? She totally did. She started asking really interesting questions about how things would work and how the bag should look and behave. And as I drew, she kept asking these amazing questions- and the sketches kept coming and getting better. And now, after a bit of that, I’ve got the best design I’ve come up with in a good long while. It’s amazing what someone unafraid of asking questions can do for the creation process. He’s not wrong- the applications the original article talks about are basic and only interesting if you compare them to pretty terrible teaching techniques. I’m not here to pile on about it, because there’s no need and Dan nicely covers the bases. I’m here because his article triggered an idea, and I needed a place to work that out. In his response, Dan brings up the oft-touted benefit of video lectures: that students can rewind and review parts of the lectures to “further” their understanding, or to “clarify” difficult concepts. He also (rightfully) points out that that’s not how this really works- you don’t ask someone to repeat exactly what they said again when you miss something the first time. You ask for the variation- the alternative take. Another angle on the whole thing, that might better clarify that difficult concept. An instructor does a short video about a difficult concept. For that video, we follow current best practices and keep the video sub-six minutes, we have good graphics, speedy and natural delivery, and all that goodness. The same instructor records several other takes- and that’s not variations on the first video, but alternate methods. Maybe a metaphor. A real-world example. An animated version. Whatever. The student is eventually served that first video, and at the end of viewing, is presented with something like a “Got it?” button. If yes, move on to the next thing. If no, student gets served one of the alternate videos on the subject. Repeat until the answer is yes. Over time, analytics show which video versions are most useful (as they’re likely the last version watched…), and we can start feeding that data back into the creation of video segments (so, for example, if the animated graphic version seems to do best, that becomes the primary video in the future). Indeed, most LMS systems would allow those video analytics to be collected per-student, and you could eventually begin to serve each student individually the version of the video most (statistically) likely to suit them. You’d want to keep that model somewhat fluid, as students will find different variations work best/better on different subjects. I’ve not seen this done, but in retrospect it seems pretty obvious. If you’ve seen this work somewhere, could you send me a link? I’d like in on that action. 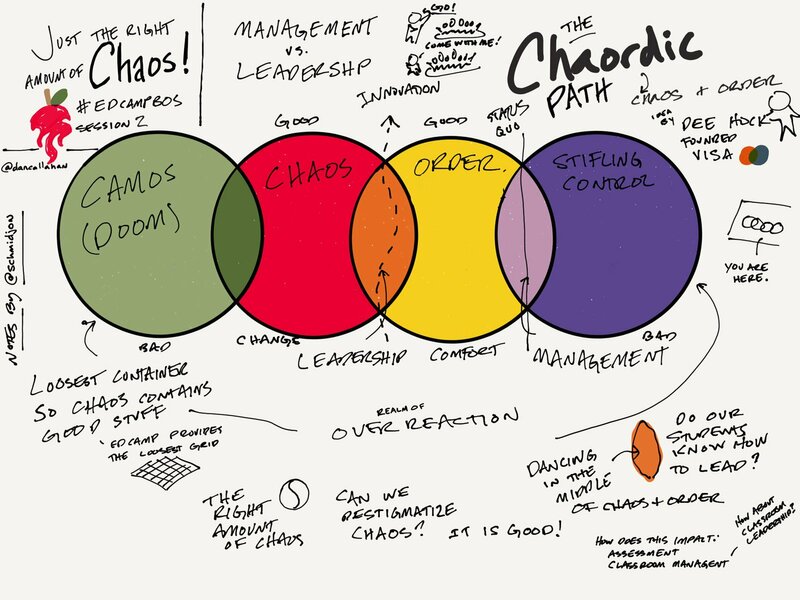 Since I went to EdCamp Boston a bit ago, I’ve found myself thinking about the session Dan Callahan led about the Chaordic Path. It was a great session, and the Chaordic Path idea slipped nicely into my existing structure of understanding of learning spaces. My issue (or, rather less judgmentally, my thought…) is more centered around the graphic commonly associated with that idea. There are a bunch of topics that I’ve spent time dealing with in classrooms over the years (mostly in regards to themes in literature) that students have struggled with, and many of those themes seem to have the same thing in common: they occupy a spectrum. Or, if you’d rather, a continuum. Things like “Good vs Evil” or “Light vs Dark” or “Male vs Female” come up over and over, and while student at first gravitate towards them, as the inherent complexity becomes more clear, they find themselves struggling with the ideas. What they want initially is a nice binary choice: things are either good or evil (but not both). It’s ok if a character switches from good to evil, but students want to treat that like a switch- one moment they’re good, the next and they’re evil. But that’s not human reality- people (fictional or otherwise) are rarely wholly good or wholly evil. More often they’re complicated mixes of the two that vary both based on the time but also based on your perspective as an observer. And so: we find ourselves trying to explain continuums. They are, of course, familiar with a number line, but they are not used to applying that sort of model to other aspects of human life. Gender. Sexuality. Order and Chaos. Good and Evil. Light and Dark. We want to represent the complexities of life as simply as we can- that’s part of the efficient transmission of information. But we must learn to be careful in classrooms to not adopt such simplified models that we loose the inherent meaning imparted by the continuum. Instead of allowing binary choices to abound, it’s time to start showing students that most of what they think of as binary simply isn’t, and to treat is as such is reductive. It is a cheat- to reduce something complex to an overly simple model allows flawed thinking and cognitive fallacy. It’s ok for things to be complicated. It’s ok for there not to be easy answers to seemingly simple questions. And it’s ok for our answers to change based on when/where/how/who is doing the asking (and for the questioner’s perspective of our answers to shift, too). Asking a student if a character is good or bad is a fine start, but by broaching the idea of there being a full spectrum of good vs bad (and that a given character’s position on that spectrum might not be a simple thing to answer) allows students safe ways to begin to understand that complexity. Dan’s presentation of the Chaordic Path was very good (clearly, as I’m still thinking of it several days later…), but it’s the graphic I want to address. The interlocked rings are a good start (and, for the purposes of the session, likely the right choice). But I find myself thinking that a line- a simple line representing the spectrum of spaces between Camos and Stifling Order does a good job of illustrating both that these gradations exist, but also that an environment can easily slip between these areas over the course of a lesson or day. In my mind, it’s a spectrum with “sweet spots” on it where especially useful conditions seem to exist. I was really happy to see #satchat up and running still- it was one of my favorites when I was doing that sort of thing a lot, and it made me happy those good people are still fighting the fight. I was less happy that some of the topics were still up for debate. This particular week was about the value (or not) of homework, and I was kinda bummed out. That is, for me anyway, a settled topic. The research is clear. I’m not sure why we’re still having that conversation. I can still say things that seem to resonate with people. I’ve been out of the K12 world for couple of years now, and I had started to worry if my fire was still burning (internally, of course) on some of those issues. It is. I can’t commit to doing #satchat with any degree of consistency- I’ve got my own (small) children to manage, and Saturday morning can be a… fraught… time. Regardless: it was good to poke my head back in and see that some of my ideas, opinions, and views still seem to fit into the K12 conversation. Last night, just before getting off the train on the evening commute, I sent out a tweet. It was mildly political and mentioned William Gibson in it- who was the author of the quote I was mentioning. He, in turn, re-tweeted my tweet, and thus began a night of my phone exploding with twitter notifications. By the morning that’d mostly settled down. Gibson has ~178K followers on twitter, and in the twelve (or so) hours since I sent the original message, that tweet got 92 retweets and 126 favorites. In my world, that’s a lot. When I checked the twitter stats on it, I found that it was seen by just over 20,000 people and “engaged with” by just over 3,000 people. That’s way above any sort of average engagement I get. So I was curious as how this new-to-me attention would manifest in the rest of my online presence. Would I get subscriptions to my newsletter? Follows on twitter? Would my (this) website see a spike in traffic? Of the 20,000 people who saw the tweet, two followed me. 23 clicked my bio link in twitter (which has this webpage link in it), and of those, 8 actually got here. Zero subscriptions to my newsletter. So here’s what I’ve learned: twitter is a land unto itself. Things that happen there are largely isolated there- so if you want people to read something, it best be in the tweet. If you provide a link to something- it’s not getting clicked. Your profile isn’t going to be raised anywhere else. Indeed, any single spike on twitter isn’t even going to do much for you on twitter. The engagement you see there is only there, and it’s isolated from the rest of your online presence. What do I do with this information? I change the way I tweet a bit. It’s less about links to things now- at least, no links without some of the content attached. I’ll stop worrying about trying to use twitter as a device to drive traffic anywhere else- no matter how easy I think I’ve made that. I’ll let twitter just be twitter. So you want to be a teacher. His argument hinges on a simple truth: in the act of making a film, these skills trump the theoretical offerings of a formal art school. And while thinking of this, it seemed clear that there were things you should know and study that they weren’t teaching in education school. To that end, I’ve put together a list of the skills and areas of study that I feel are crucial to being a good teacher- but that aren’t taught in any typical education program. And not some simple statistics-for-education. A real, honest to god statistics course. Knowing how to interpret data is crucial- both so you can see the actual meaning of what you’ve gathered, but also so you can see when someone’s trying to pull the wool over your eyes. If you think teaching isn’t an act of performance art- stop. Withdraw from your program and give up. You are not presenting yourself as you teach- you are presenting a created version of yourself that best allows you to teach. That’s acting- and you’re going to be doing it six hours a day, five days a week, 180 days a year. If you’re uncomfortable with that fact, this job isn’t for you. Walk away. Students deserve materials that are well designed- and that’s not just a matter of them “looking better” mind you- good design addresses having the form help the function. I know that Comic Sans is listed as a font on your machine but trust me- it’s not. Not only is it hideous and an abomination- it’s not very readable. It is not in the best interests of your students no matter how “nice” you think it looks. A decent design course can help give you the sensibilities to make better choices. I took a 32 hour course in restraint training- physical restraints, that is. In my time in conventional classrooms, I never once had cause to put hands on a student. That’s a good thing. What was most interesting about the course was that it spent MORE time on de-escalation techniques than on the actual physical holds. In fact, the mentality was that if it comes to a physical interaction, you’ve already lost. Everything is about slowing things down and calming people. That part of the training I used nearly every day- with students and staff. Digital delivery is a given today- you need to be adept, comfortable, and effective at making short films. There isn’t any more “that’s not my job” or “it’s too hard” or whatever. Consumer grade computers capable of digital video editing have been around since at lest 1999- learn how to shoot and edit video. It’s a thing now. Dealing with projects spread across some 120 students in various states is as clear an example of project management as I can think of. Learn some tools and techniques to be able to deal with that sort of volume of creation. I can’t even tell you how many times lock picking was useful in my teaching career- and having some solid A/V experience let me do a lot of things I wouldn’t have been able to any other way. Or how being able to circumvent a firewall/filter was crucial to teaching a lesson. But the above list, I think, represents more along the lines of how we should be thinking about educating teachers. Lateral thinking should be encouraged, rather than the step-by-step adherence to the latest regulations. 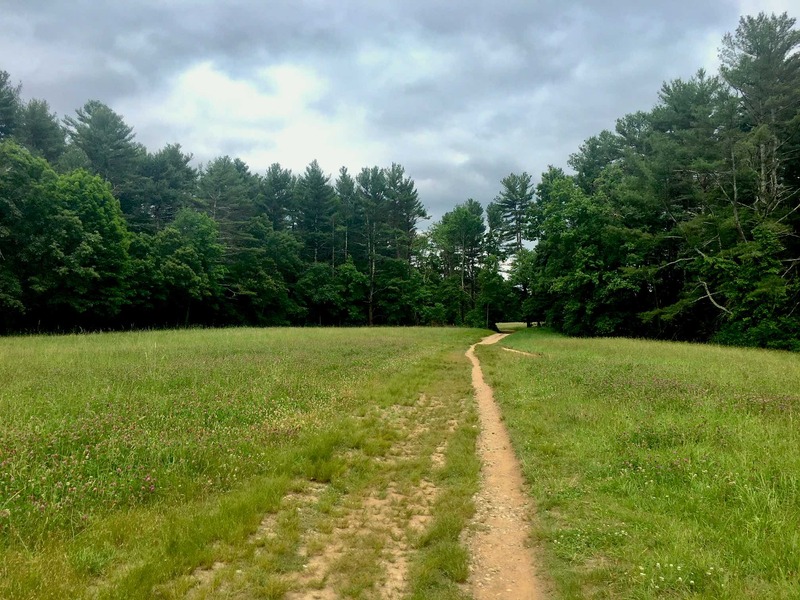 I’m not sure I could recommend going into the field to anyone right now- the deck seems so heavily stacked against the ability of good teachers to do what they do best… It’s too big a subject to tackle in this post, I know. There seems to be so much emphasis on “making sure” that “teachers are doing their jobs” (as dictated by a group of distinctly non-educators, mind you…) that there’s no room for good teachers to do their thing. Still. If you’re in the process of entering the field, and you’re wondering what elective courses to round your program out with- there’s my pick. This has been brewing for a while. Ask anyone who works with me (as I’ve likely ranted at them recently), and I’m not the first person to have the thought. Still. The difference between what we know and what we do troubles me. Examples? 2. We know sitting is bad for us. We continue to fill classrooms with chairs (and demand students stay in them). 3. We know physically assaulting a child is not an effective method of discipline. We pass bills (in 20 states!) that allow it anyway. And sadly, there are many more. So many more, I’m afraid, that I can’t even begin to enumerate them here. And for me, it was the realization of how different our schools would look if we took into account the things we know.